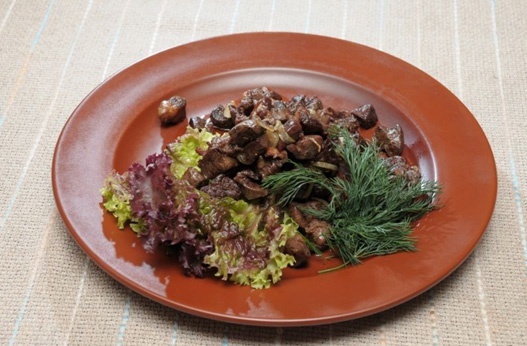 Khinkali is traditional dish of Armenian cuisine. Prepared from the offal. The dish is delicious, hearty and healthy. Offer a simple recipe. Liver clear from the films and remove the bile ducts. Liver, lungs, heart, fat-tail wash well with water. Prepared foods cut into small pieces, the same size. Meat products spread on a heated pan. Fry in sunflower oil until soft ( 8-10 minutes), stirring occasionally. Cut the onion into small cubes. Add to the meat onions, tomato paste, chopped herbs, salt and pepper. Mix well. Reduce the heat to low and simmer under a lid for 20-25 minutes. Harisa is ready! Bon appetit! Sometimes locknuts add more kidney and esophagus. As a garnish you can apply mashed potatoes or steamed vegetables. Before serving sandwiches with cheese sprinkled with fresh herbs. Instead of bread, served pita bread.